Magnesium & Calcium provides two vital minerals, with added Vitamin C for optimum absorption and efficacy. Calcium plays an important role in the development and maintenance of healthy strong bones. Magnesium is necessary for the metabolism of Calcium, and is useful in supporting muscular, cardiovascular and nervous system functions. - Important for the healthy development and maintenance of strong bones and teeth. - Helps maintain healthy muscle contraction and function. - Helps stabilise rhythm the of the heart. Calcium (calcium carbonate, calcium citrate, calcium malate, calcium gluconate), Magnesium (magnesium oxide, magnesium citrate, magnesium gluconate), Vitamin C (ascorbic acid), Microcrystalline cellulose, Crosscarmellose Sodium, Acacia, Maltodextrin, Veg. Stearic acid, Hydroxy Propyl Methyl Cellulose (HPMC), Titanium Dioxide, Veg. Magnesium Stearate, Magnesium Silicate, Triacetin, Mineral Oil, Poly Vinyl Pyrrolidone (PVP). Adults and children over 12 years of age, three tablets daily, preferably with breakfast.Do not exceed recommended daily intake unless advised by a suitably qualified person. 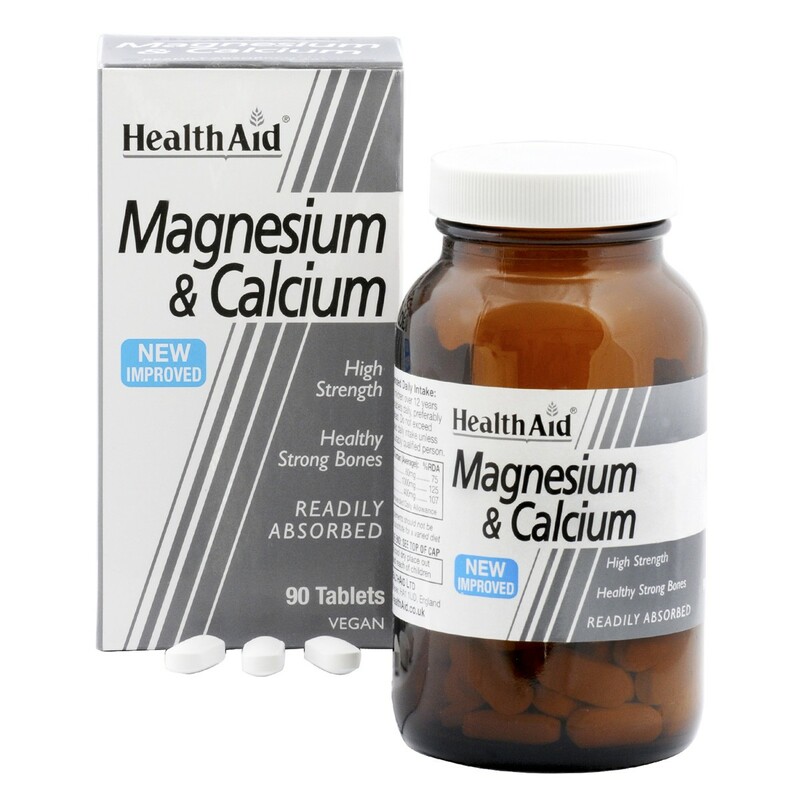 Thank you for your interest in HealthAid Magnesium & Calcium. Enter your email and we'll contact you as soon as it's available again.